I love ice cream, what about you? And for me, it does not matter if it’s winter or summer, I think it’s the kind of thing that goes well year-round. Here in New York, there are many cool ice cream options for you to explore. At that time, living here, I learned to appreciate ice creams with different textures and flavors. Here, for example, it is very common for ice creams to have added sea salt in some options – which I particularly love! And, below, I’m showing you the ice cream shops that I consider the best in New York! Morgenstern’s Finest Ice Cream – this ice cream shop became famous because the black ice cream – Coconut Ash, which has a very accented coconut flavor. I tried and enjoyed it though, the Salted Caramel Pretzel is much better. Here, the recipes are thought and developed for each flavor. The integrity of the ingredients is not compromised by stabilizers or additives. Also, they also have sorbet, great choices for vegans and/or lactose intolerant. 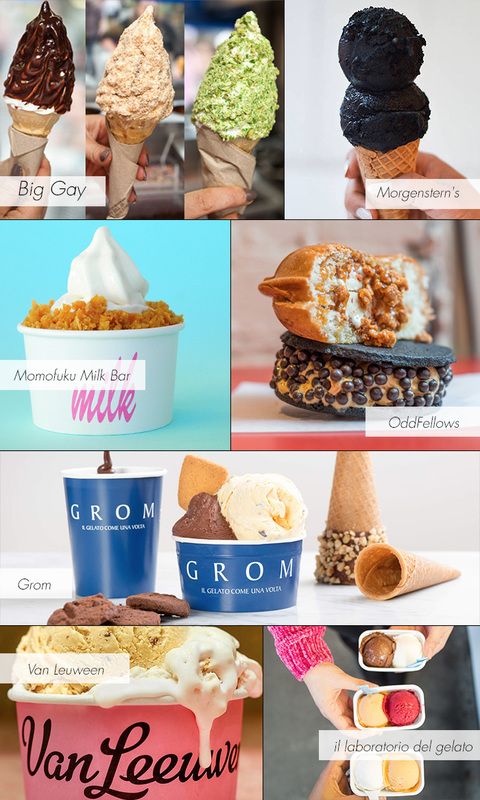 Momofuku Milk Bar – – is a bakery – with cookies and cakes – but the highlight here is the ice cream, one of the most famous in the city. The classic flavors are Cereal Milk, with milk, cereal, brown sugar and a touch of salt, and Chocolate Covered Pretzel Soft Serve, which is a chocolate, with a sweet and salty flavor, difficult to explain, but peculiar and tasty. Locations: check out all the locations. OddFellows – To create the highest quality and freshest product available, they pasteurize theyr own ice cream base — using locally-sourced, hormone-free and additive-free dairy — in their Brooklyn kitchen. While more time consuming, pasteurizing on the own location allows them to add more nuance and depth into our ice cream flavors. Another OddFellows highlight: the ice cream sandwiches. Locations: 175 Kent Ave / 75 East 4th St. / 55 East Houston St.
Grom – authentic Italian gelato. Grom doesn’t use aromas or colouring agents, and nor do their suppliers. The gelato gets its taste and colour exclusively from the raw materials used, depending on the season and availability. Also, this is another highlight: the menu changes every month. It is a very classic place in the city and they are also known for the hot chocolate. Locations: 233 Bleecker Street / 1796 Broadway / 185 Greenwich Street (WTC). 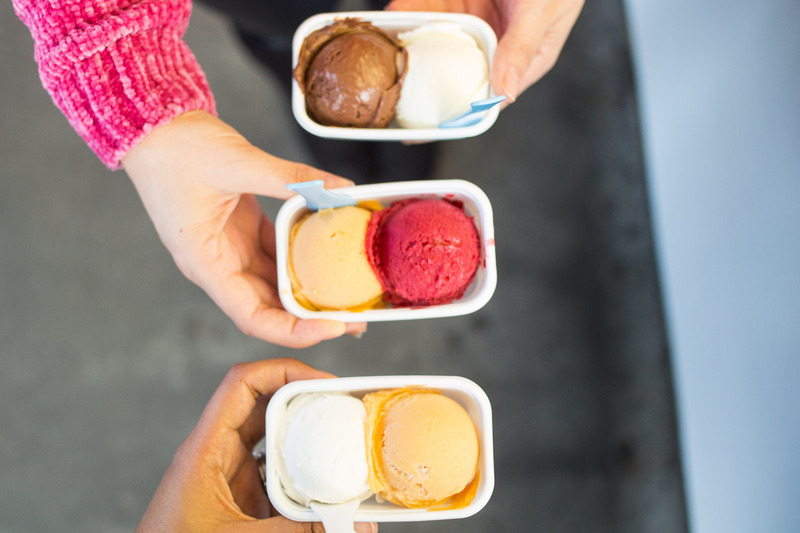 Van Leeuwen Artisan Ice Cream –this Ice Cream place started in 2008 out of a buttery yellow truck on the streets of NYC. They make all their ice cream from scratch in Greenpoint, Brooklyn. The Classic scoops are crafted with nothing more than fresh milk and cream, cane sugar, and egg yolks. The Vegan scoops are made with housemade cashew milk, organic coconut milk, organic extra virgin coconut oil, organic cane sugar, pure cocoa butter, and organic carob bean. There are a lot of flavors and it is delicious! Locations: Brooklyn: 204 Wythe Ave / 620 Manhattan Ave / 81 Bergen St / Manhattan: 48.5 East 7th St / 152 West 10th St / 224 Front Street / 172 Ludlow St.
il laboratorio del gelato – this place serves about 200 flavors at its location in the Lower East Side – and beyond the classic and traditional flavors to which we are used to, the place also has other, super unusual. Do you want some examples? Olive oil, sweet potato, red beans, rosemary, basil, ricotta, avocado, beet … That’s the reason of the name “laboratory”, where chefs and caterers are encouraged and welcomed to work with them to develop unique flavors for their individual menus. The place provides ice cream to restaurants in the city, who use the product in their desserts. Obviously, the offer of flavors varies according to the day and the time of year, but there is always a varied mix of ice cream and sorbet. Two flavors cost $4,25. Try the chocolate one – it tastes like a mousse! Locations: 188 Ludlow St / 56 University Pl.